DEL MAR — In addition to electing three council members and weighing in on 17 state propositions and a handful of county measures, Del Mar voters will decide the fate of two city initiatives Nov. 8. Measure Q seeks to increase the sales tax by 1 percent. Measure R asks if voter approval should be required for proposed development in a commercial zone that is 25,000 square feet or larger, allows a density bonus or requires a specific plan, a zoning code change or an increase in the building height limit, floor area ratio or lot coverage. In July, City Council members unanimously agreed to put Measure R on the ballot after a survey indicated more than 70 percent of registered voters support the increase. It could add an estimated $1.5 million to $2 million annually to city coffers. Support is strong because city staff estimates 70 percent of the sales tax collected in Del Mar is paid by the 5 million annual visitors. Residents, including City Council members, see it as a way for tourists to “pay their fair share” of public safety, infrastructure and maintenance costs. While the money could be used to repair streets, improve the downtown streetscape, underground utility poles, implement the Shores master plan or expand public walkways and trails, no specific project or service that would be funded by the additional money can be identified at this point. Council members, based on public input, will approved those decisions. The city could not collect sales tax on internet sales unless the company has a presence in the city. The increase applies to taxable goods sold at the Del Mar Fairgrounds except large items such as cars and boats. That tax money goes to the city where the vehicle is registered or docked. Although residents seem to overwhelmingly support the hike, businesses do not. They submitted a petition to the city in opposition. Because many owners are not residents, they could not take part in the survey. They say the increase will hurt business at a time when downtown storefront vacancies are high and they are facing increased costs, mostly to comply with state requirements including a minimum wage hike to $15 an hour within the next few years. 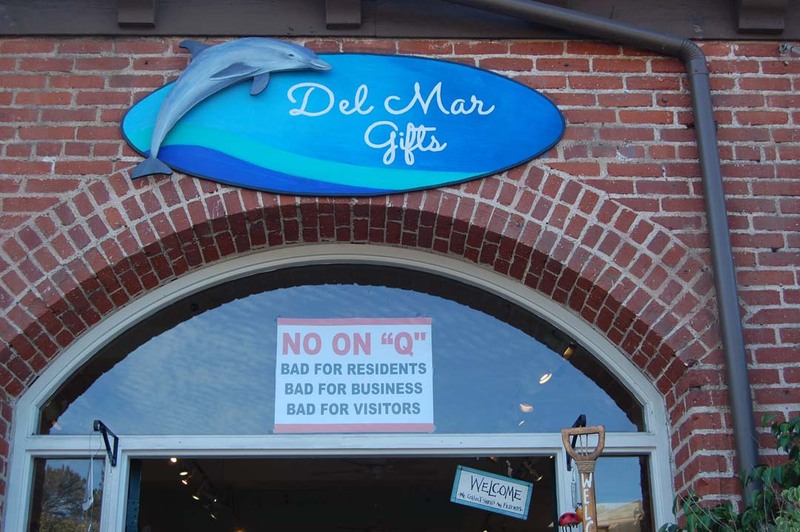 Some people also say it sends a negative message about how Del Mar feels about visitors. While Measure R doesn’t specifically identify a particular project, it was created in response to Watermark Del Mar, a 48-unit multifamily complex near the fairgrounds. At an Oct. 5 forum moderated by the League of Women Voters, representatives presented arguments for and against the measure. Roger Arnold, an economics professor at California State University San Marcos, said Measure R ensures that the general interests of residents are best served when voters -— not three of five City Council members — are allowed to decide the fate of large developments. Resident Arnold Wiesel, who led the effort to gather signatures to qualify Measure R for the ballot, said the proposition does not change the Community Plan, state-approved housing element or municipal code other than requiring public approval for large projects. “I am an enthusiastic supporter of the right to vote on major changes in Del Mar,” Bud Emerson said. “R is a reach too far. It creates a lot of unintended consequences. It conflicts with a lot of existing law, existing ordinances, existing specific plans. Wiesel called the litigation threats a “scare tactic.” He said if the measure is legally problematic, council members shouldn’t have agreed to put it on the ballot and the city attorney should have stated that in her ballot summary. Wayne Dernetz, a former Del Mar city manager and Vista city attorney, said the city attorney is obligated by the elections code to prepare a ballot summary but is not permitted to include a legal opinion. In a separate report the city’s legal team summarized that Measure R would have a number of impacts on city land use regulations and its ability to comply with state housing laws. Additionally, Dernetz said the city had limited options when presented with the qualified initiative. Council members could have adopted it into law, put it on the ballot or done nothing, the latter of which would have likely resulted in legal action against the city. Final plans for Watermark have not been submitted for approval as the developers are revising and down-sizing the project in response to community input. Emerson and Dernetz said they would support putting the final Watermark plan to a vote. Wiesel said he is not concerned about the possibility of the measure conflicting with state law. “You could take any law to court,” he said. “Violating state law’s not a problem because it’s going to trump (local laws). If a court determines the measure conflicts with state law it will be nullified, Dernetz said, noting that litigation is always arduous and time-consuming.